Very early in my career, a colleague shared a resource with me that I have found incredibly helpful. It’s called a Solution Wheel. When kids are having a conflict, sometimes they don’t always know what to do. In the moment, they can’t remember things that they can do to help work through a problem. 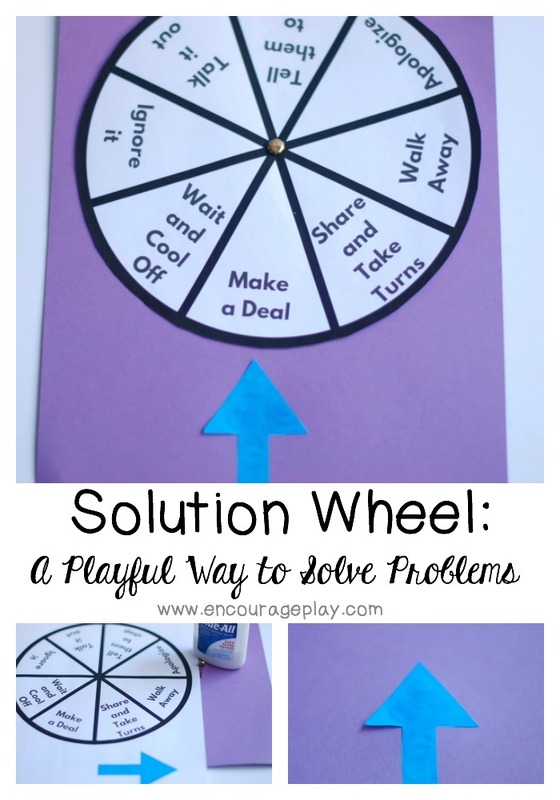 Using a solution wheel is a great resource to help them figure out different ways to solve a problem. One of the reasons I do like this lesson is because it’s working on solving problems AND you can also make it a crafts project. Yay!! Have the kids pick a color of construction paper they want to use, then cut out the solution wheel and an arrow. Glue the arrow to the bottom of the piece of construction paper, having the bottom of the arrow line up with the bottom of the construction paper. Connect the solution wheel to the construction paper using a metal brad so it can spin. NOTE: Let the kids know this is not a type of wheel that you just spin and try the solution you land on. You turn it until you find a solution you want to try. Two kids are arguing over which game to play at recess. What could you do? You are getting frustrated with your little brother’s behavior. I’ve used this in school settings and in social group settings, and kids have responded well to it. I always explain it’s another resource to use when you’re having a hard time working through a problem. In my office at school, I even had a large version of this hanging on my wall. I would always be very clear in stating that this is not going to solve every problem all the time, but it was a good place to start. You can always make your own wheel with your own solutions. I made a free printable for you to download and use at school or at home. Give it a try today! This post was part of the Blogger 52 Project at The Quinntessential Mommy. Stop by and check out the other posts from 51 other bloggers!